As you get to know your new class, you will no doubt notice that some children seem to attract friends with no effort at all. They instinctively know what to say and do. Others are not so fortunate. Those are the kids who sit alone at lunch, who can never find a partner without being paired by the teacher, and who will go to the library during recess or stay in to help a teacher, if given the chance. Sometimes they are simply unnoticed by peers, but more often than not, they are actively disliked. Studies have shown that just having one friend can make a significant difference in the life of these neglected and rejected children. 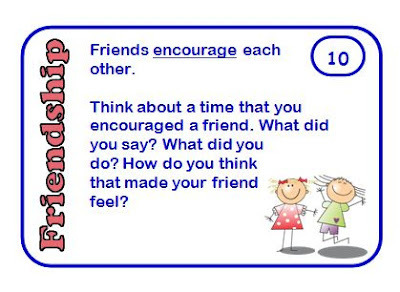 That is why I created this set of Free Friendship Cards. 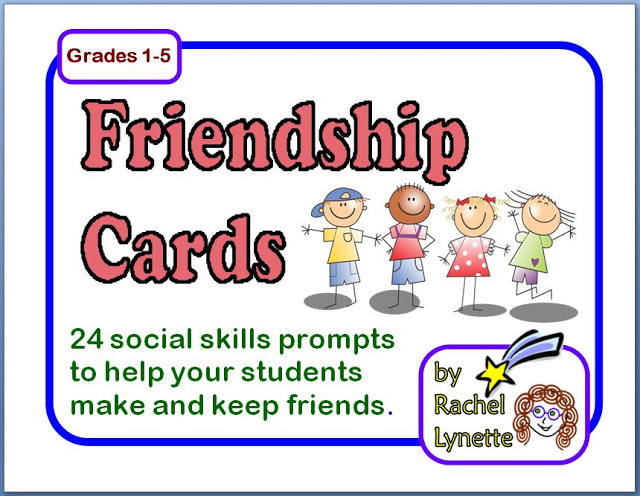 These cards were designed to benefit all children, not just the ones in need of social skills help. There are many ways you can use them in your classroom. Select a card and use it as a discussion prompt. Students can share ideas and stories from their own lives. You could also have students try out some of the suggestions. 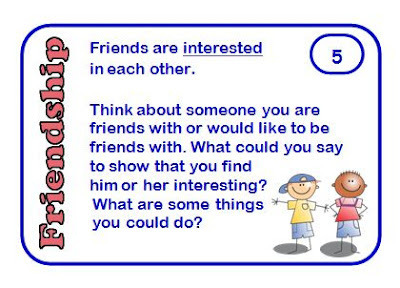 For example, in the card below, students could share things they find interesting about their classmates. This would be especially effective after doing a Get-to-Know you warm up activity in which students learn more about each other. 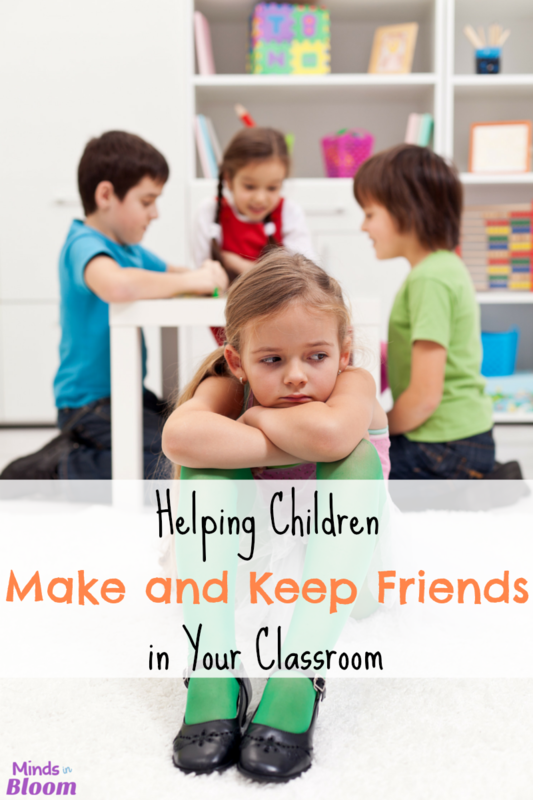 For some children, sharing in a small group feels safer than sharing with the whole class. Small groups, or even partners, may help these children to open up. You will want to be sure to establish rules, such as not interrupting or criticizing the speaker. The card below might work better in a small group than with the whole class. Perhaps you are having a problem with bullying or with students excluding others. 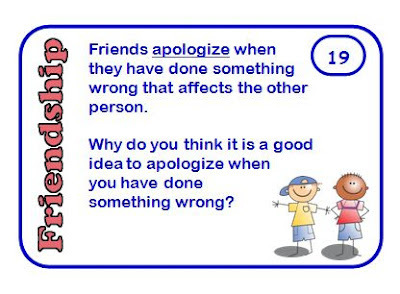 Try using a Friendship Card to explore the issue from both sides. 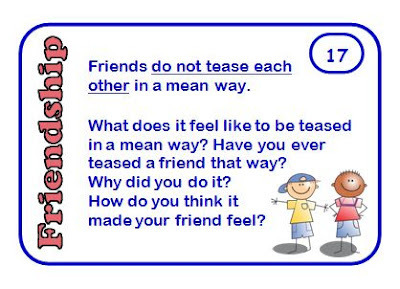 With the card below, you could not only use the prompts on the card but also talk about what constitutes “mean teasing” as opposed to good-natured joshing. Role playing is an effective tool because you can use it not only to demonstrate positive behaviors but also because it helps both the participants and the observers to really feel the emotions associated with the role play, even though it is just pretend. For the card below, you might split your class into pairs and have each pair come up with a solution to role play. Another interesting twist is to assign some groups to come up with a bad solution. Then you can contrast the feelings and results of the bad solutions with the good ones. I hope these suggestions have been helpful. Please feel free to comment if you have more to add or if you would like to share how you have used these cards with your students. 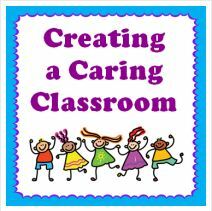 For more ideas about how to create a caring classroom, visit the Caring Classroom Link Up at Laura Candler’s Cork Board Connections. These are fabulous Rachel. I had a student last year who was the child you spoke about in the beginning of your post, and it broke my heart. I can't wait to try these out in my room this year. Thank you for posting! These are really great. Our counselor comes in to do Friendship Lessons with our 4th graders at the beginning of the year and I can't wait to show these to her to use with my class. Thanks for sharing! I used these last year and LOVE them. We had volunteers share their writing, act out with a friend, etc. 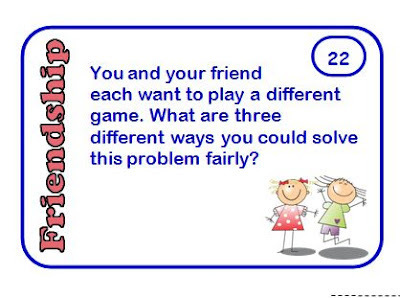 They are wonderful to look through and pick one that fits a problem the class is currently experiencing or select cards for specific groups of kids and differentiate a lesson that way. I differentiated based on the social concerns I had for different members of the class and had them work as teams to present to the class. I was able to target certain behaviors without singling out any students because everyone was working on social issues. It worked so well. Thank you! This looks like a great idea and a good way to get kids talking about things that matter. Communication builds relationship. Thanks for sharing!